Slot Games listed are Thunderstruck 2, Tally Ho, Twister, Tiger Treasures, Treasure Chamber Slot and The Codfather Slot from NextGen. 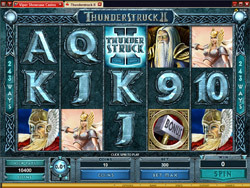 For players who are familiar with the original Thunderstruck slot launched by microgaming as one of the 1st bonus feature slots - you will be pleased to know that Thunderstruck 2 is now available. This new slot has even more exciting features than the original Thunderstruck slot with some added features which you can get as you progress through different levels. There is simply too many features to go through them all, but suffice to say that you won't be disappointed with this new slot game. The pilot symbol substitutes for all other symbols except the scatter symbol. The pilot only appears on reels 2, 3, and 4. The Free Spins can be retriggered. 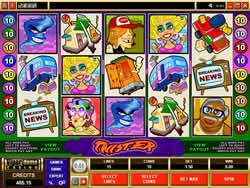 Twister Alert - The Twister Slot has come to town. Three or more TV scatters and you will be twisting your way to Free Spins. The twister symbol substitutes for all other symbols except the scattered TV's. A highly entertaining game in true Microgaming style. 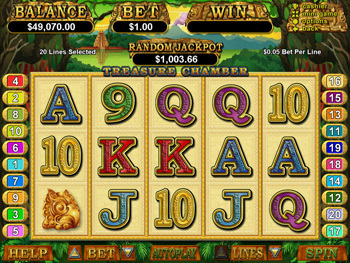 Tiger Treasures is an RTG slot game set in the jungle. The tiger symbol is wild, doubles and substitutes for all other symbols. There are 20 paylines and 5 reels and winnings are also paid from right to left instead of the traditional left to right. 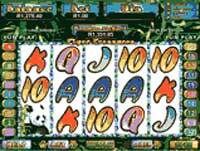 3 or more chinese symbols activates 20 free spins which can be retriggered. An exciting bonus feature slot from RTG. Treasure Chamber slot game takes you on a quest to find historical artefacts and legendary treasures. 2 scattered roses gives you a bonus payout, but if you get 3 or more of them - this will activate the free spins feature. 20 free spins will be given at 3x payout. 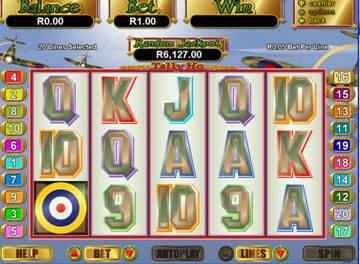 There is also an added feature of a shifting symbol which changes randomly to give you an extra payout.